1. 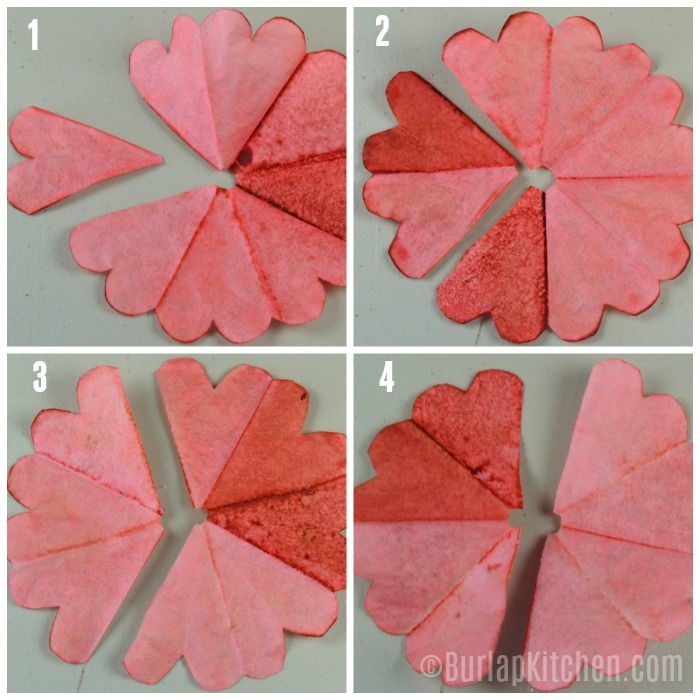 FOLD THE FILTERS: To make one flower you will need 4 coffee filters. Fold all of the coffee filters in half, then in half again, then in half again, use your thumbs and really press and crease the folds so they stay. 2. Fold your coffee filters one more time in half but this time do not crease it. Round the top, wide, part of the coffee filters with a pair of scissors. When you unfold the filters you should have what looks like a heart. TIP: If you wait to dye your filters directly after this step you will get nice dark edges. I fold them plain white, cut the rounded edge, plop them into my dye, then into the oven. 3. Now it is time to cut the hearts. You have 4 coffee filters so each time you will cut one more heart. Your first filter cut one heart, second filter cut 2 hearts, third filter cut out 3 hearts, fourth filter cut 4 hearts. Use the diagram below to help with cutting. 4. 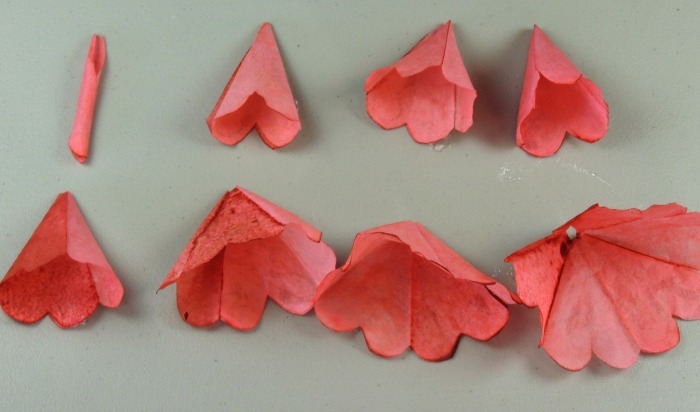 GLUE: Overlap the hearts on the end and glue them so they form a cone. Do this to all of the cut filters. You will not be able to overlap the two smallest hearts, the single and double heart. To do the smallest one I use a glues stick to roll it tight and glue it. I do the same for the double heart but you will not want to make this one as tight. When you have them all rolled and glued you should have something like this. 5. 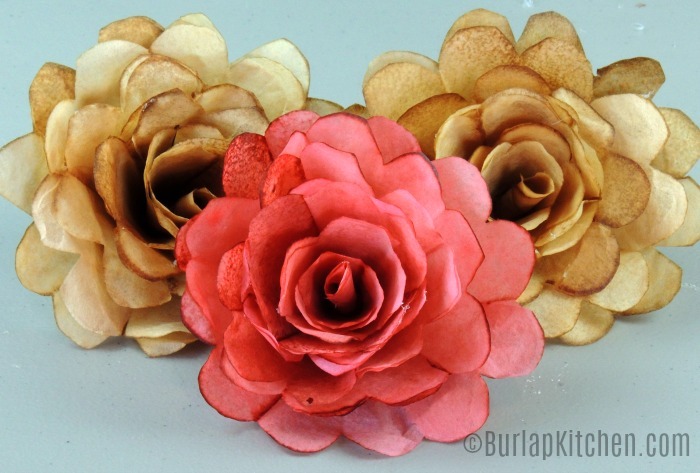 Now it’s time to start building your Coffee filter flower. 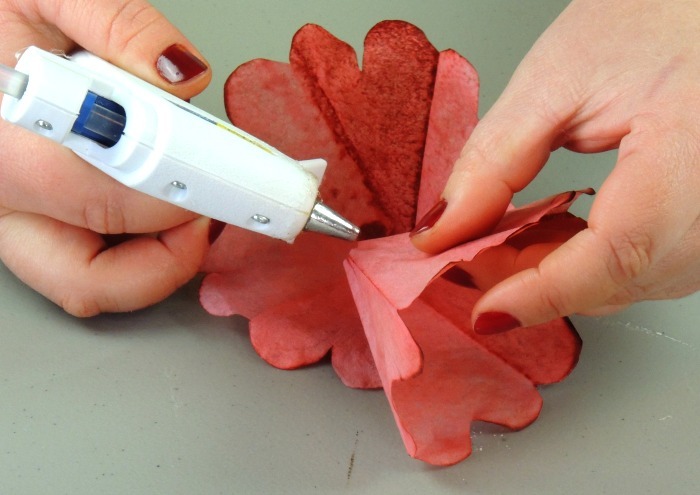 Before gluing, put the flower together and make sure everything fits nicely. Some of the bottoms will probably need trimmed so they nestle inside one another nicely. 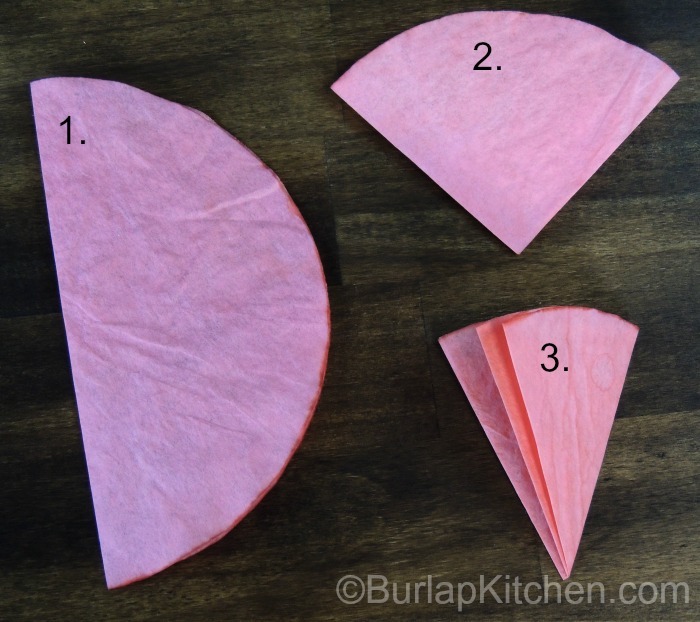 To put your coffee filter flower together start with the biggest cone and work all the way down to the single one putting each inside the other. Below is an example of what this should look like. 6. 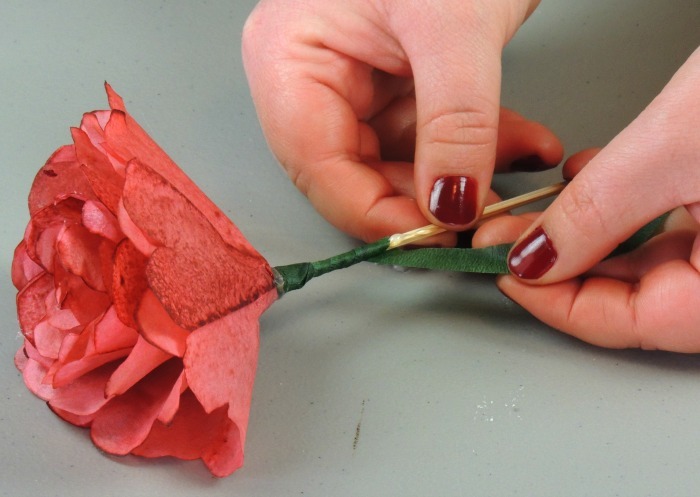 Gluing the Flower together: Now take the flower apart sitting each layer in order, biggest to smallest. Begin to glue the bottoms and gently stick them inside each layer. 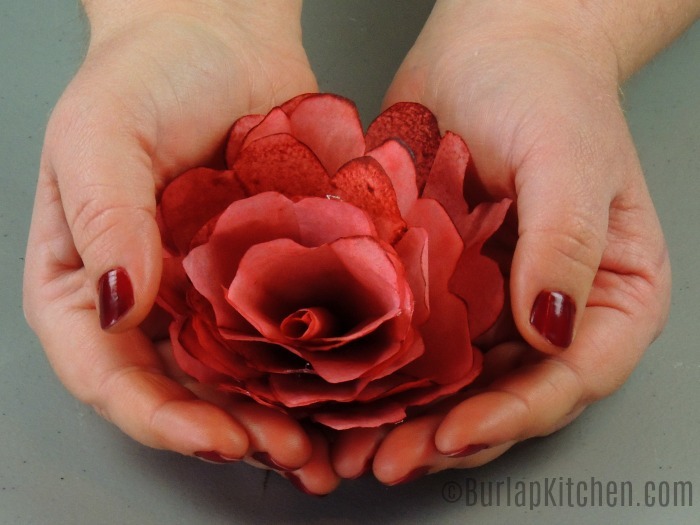 When you’re finished gluing your flowers will look something like this. Pretty, right? 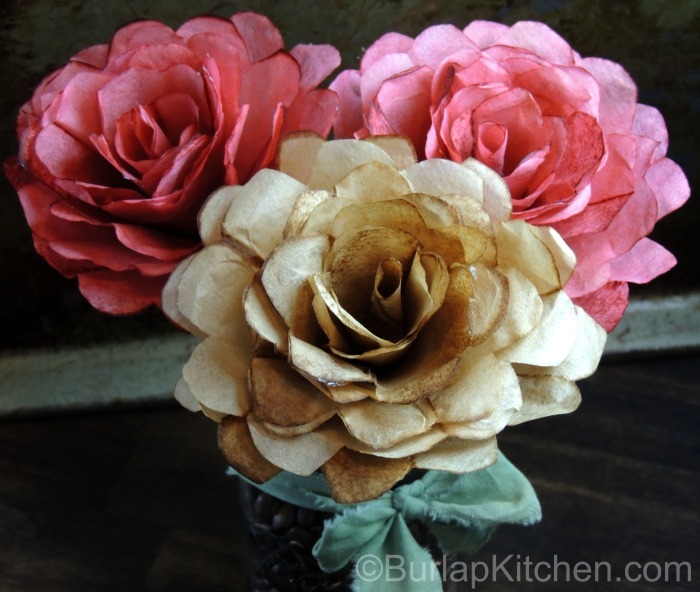 Now it’s time to add the stems to your coffee filter flowers. Here are a few materials you will need..
Use the pointy end of the shish Kabob stick to poke a hole through the glue at the bottom of your flower. Then cut the point off of the stick, glue it, and insert it into the hole you just made. Put a little glob of glue around the base so it is secure to the stick. 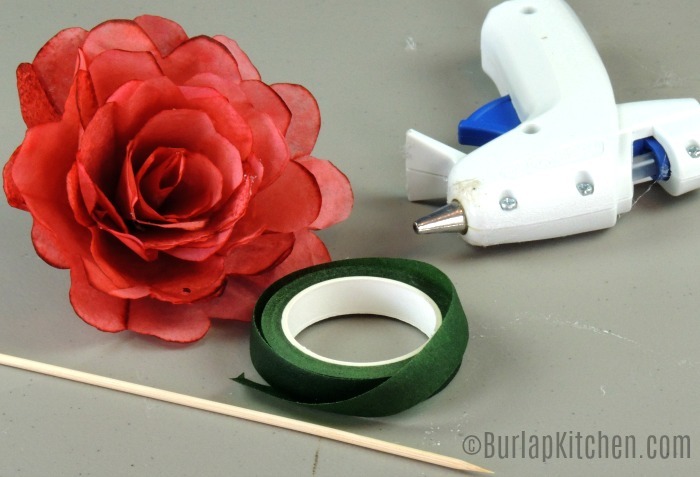 Finally, glue and wrap the floral tape around the flower stem. The floral tape says that it is self stick but trust me it’s not and so you will need to glue it. 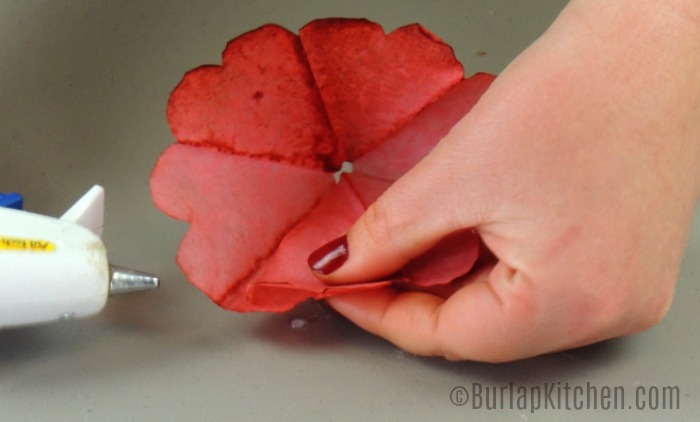 To make the flowers a little more durable I like to spray them with a clear sealant. And here’s what I use –> Mod podge Sealant.